St. Thomas has garnered a reputation as one of the Caribbean’s foodie capitals based on a palette of restaurants that range from small cafes and food stands that serve native fare to fine dining bastions where the local seafood shines and kitchens turn out cutting edge cuisine that stirs the imagination. This list culls from that colorful palette the cream of the crop restaurants that excel at their philosophy de cuisine, whether that be hearty West Indian fare such as what Gladys’ Café serves or inventive fusion like you will find at Havana Blue. 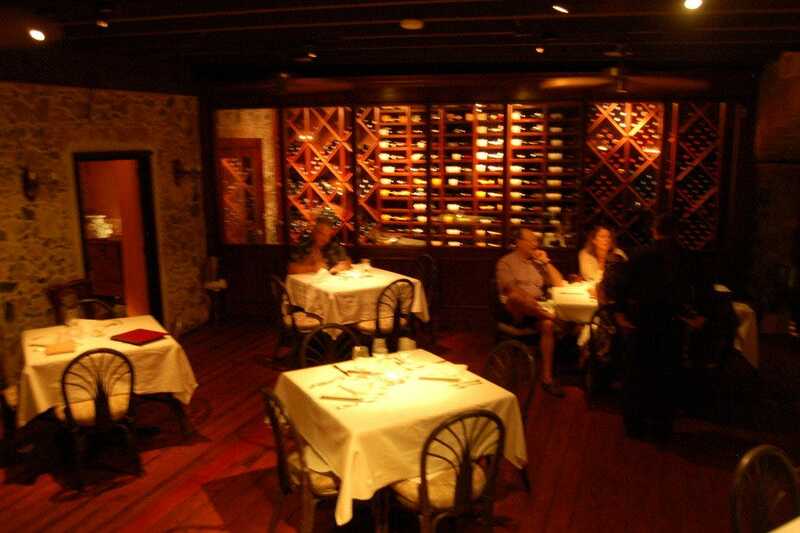 Downtown Charlotte Amalie is the scene of a lively casual dining scene. 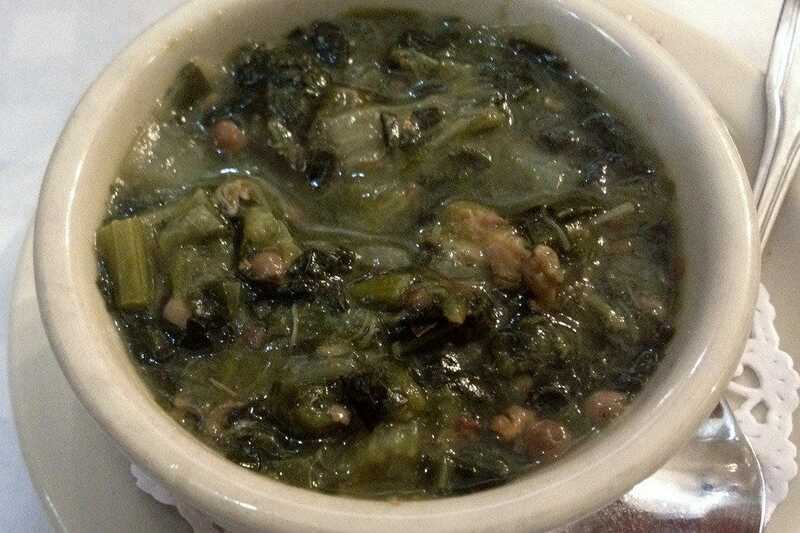 You will find West Indian specialties such as pate (the Virgin Islands’ version of Caribbean meat or seafood patties) and the islands’ signature kallaloo soup of spinach like greens with okra and meat or seafood. American food also feeds downtown’s hungry shoppers at al fresco restaurants. 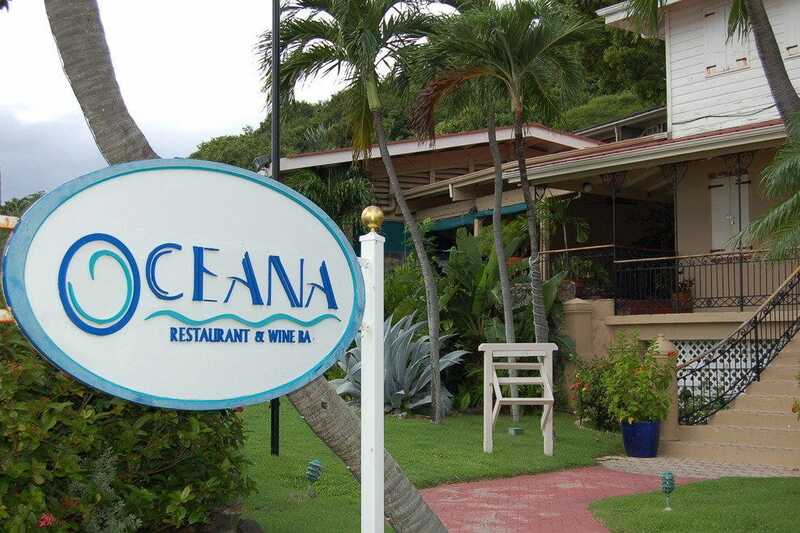 You will find some of the island’s finest restaurants at its resorts. For the freshest seafood, try the restaurants in Frenchtown and Red Hook, where commercial fishermen bring their day’s catches. 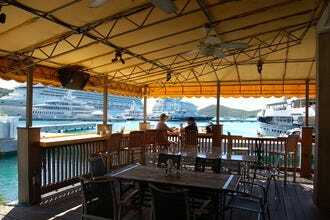 The Yacht Haven Grand shopping and marina complex is another place to find good eats. 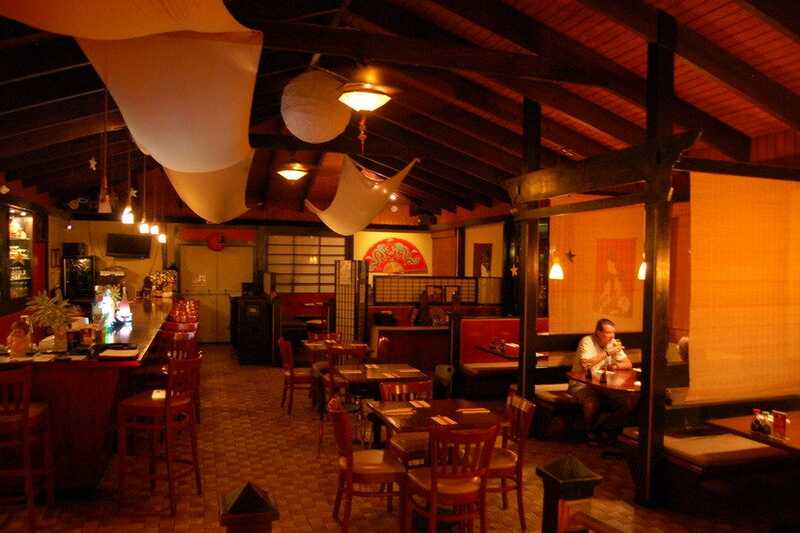 Although "sushi" commands half of its name, this simply decorated Asian themed restaurant stretches beyond its sushi bar to a kitchen that creates a number of Asian entrees, even some that use local Caribbean fish. Try, for instance, the pan-seared wahoo with fried rice or grilled lobster tail with teriyaki sweet potatoes and ginger garlic butter. Favorite sushi rolls include the baked Smooth Kriminal roll, Volcano roll and Taj Mahal roll. Or go purist with the sushi and sashimi menu. To complement your meal, Buddha Sushi offers a range of wines, cordials, Japanese beer and sake, plus some decadent desserts such as triple threat chocolate cake. Red Hook, at St. Thomas' east end, has a salty feel and taste. Open air Fish Tails overlooks the harbor where boat traffic includes commercial fishermen, yachties and ferries to St. John and the British Virgin Islands. 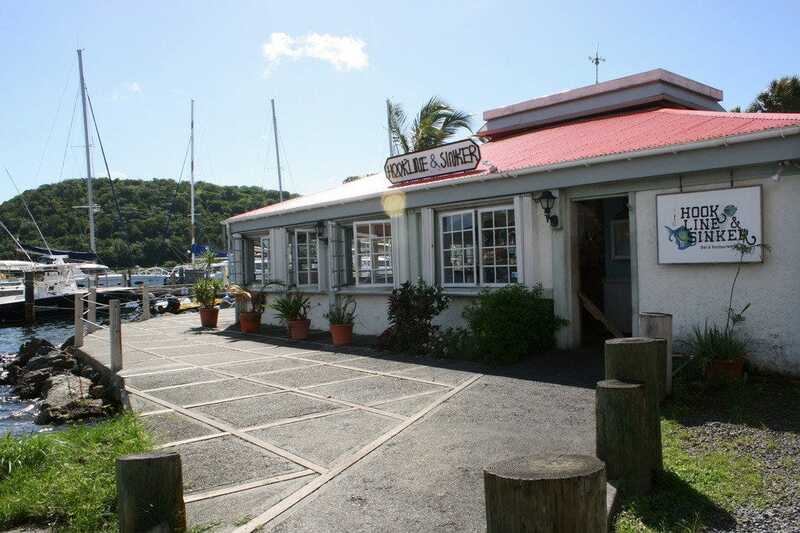 Like the BVI's iconic yachtie bars, this place is colorful and ultra casual, where the drinks flow freely and seafood dominates the menu. Share some raw oysters or sushi. Seafood po' boys, simply prepared fish, burgers, grilled steak and lobster and fried seafood platters make up the menu's offerings. It is a locals' hangout, but visitors favor too its view, vibe and variety. Stewed oxtail, curry goat, kallaloo, fungi and pan fried Ole Wife: Do not be frightened by Miss Gladys' menu. Try her West Indian specialties for a taste of true island tradition. Ole Wife is just the local name for trigger fish and is delicious done creole style with tomato sauce. Fungi is a polenta type dish. Gladys makes her kalloloo with smoked turkey and the requisite greens and okra. The undaring need not fret as the intimate café encased by historic coral stone walls also serves more conventional fare such as burgers, deli sandwiches, yellowtail snapper and conch in lemon sauce. In the morning, fishermen sell their day's catch out of the back of their pickup trucks right across the street from this nautically decorated harbor front restaurant. 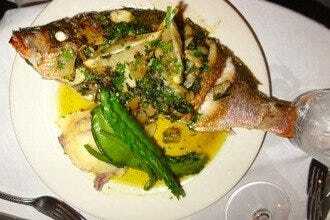 It does not get any fresher than that! Watch the boats bobbing in the harbor from inside or outside the open air restaurant with its brass accents and flung open French windows. Naturally seafood stars on the lunch, dinner and Sunday brunch menus. 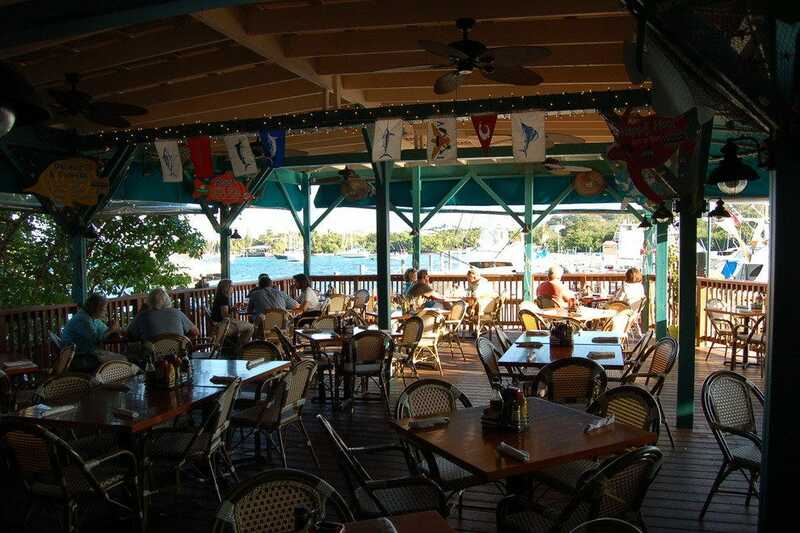 At lunch, try the snapper creole or grouper in lemon butter cream. Burgers and sandwiches satisfy landlubber appetites. Almond crusted yellowtail snapper showcases local fish at dinner, or try the conch in lemon sauce or local lobster stuffed with shrimp. Pasta and sandwiches are also available at dinner, just make sure to budget your appetite for "Auntie's rum cake." Something of a hidden gem at hilltop Mafolie Hotel, it goes the continental route cuisine wise, while adding authentic Caribbean accents to the whole concept. Start with a cocktail at the bar with its straight on view of St. Thomas' mountainside and sea scapes. It is a great place to watch sunset, but the view remains dazzling once the island's lights begin to twinkle on. The "famous" pot fish is a specialty, baking or frying whole the local fish of the day with a lime onion and pepper sauce. Mafolie's kallaloo greens soup gets elevated with shrimp and crab. The crab cakes appetizer derives its West Indian flair from sweet potatoes.The filet mignon gets treated to a demi glaze made from the local guava berry (no relation to guavas). With the Danish barbecue ribs come polenta-like fungi and a breadfruit mash. Order a side of sweet potato and coconut dumpling. 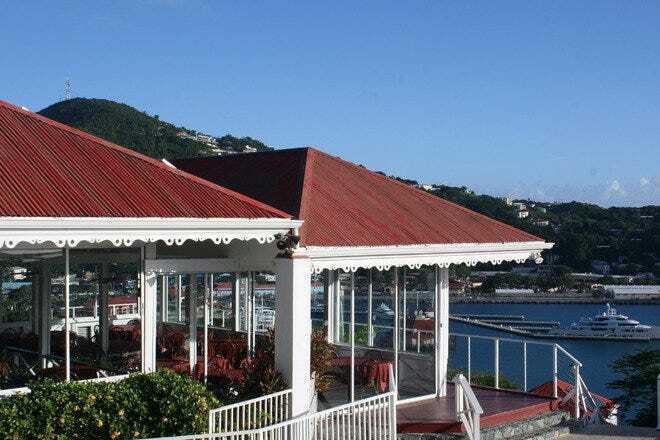 A stylish and elegant surprise in St. Thomas' Frenchtown community, it is a shooting star on the island's culinary horizon on the waterfront. Owner and Patricia LaCorte has put together a succinct but inspired menu that uses local seafood and produce to their best advantage. Here's a sample of her genius: artisanal beet salad with gingered Greek yogurt and truffle honey; seared diver scallops with candied bacon, torched grapefruit, basil foam and fennel vinaigrette; toasted coriander dusted mahi-mahi with lime butter and creamy polenta; homemade ravioli with confit grape tomatoes, roasted garlic and chevre gratin. Oceana manages to treat seafood and steak with equal aplomb and verve. 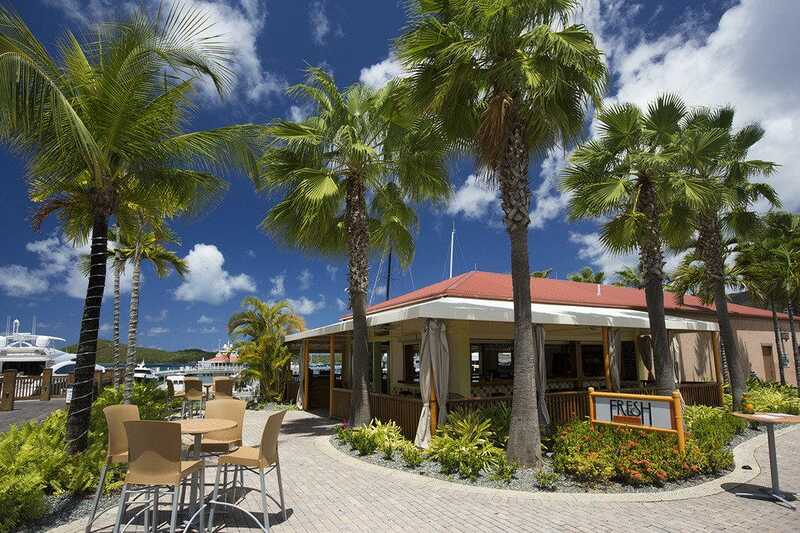 By the same inspired chef who brought Oceana to St. Thomas, Fresh Bistro is the latest yachtie food stop at Yacht Haven Grande. Its indoor and outdoor setting overlooking the yachts in harbor makes it appealing to locals and visitors alike. Its small, succinct, all day menu revolves around salads, baguettes, tartines and gourmet burgers made with grass fed beef and sun dried tomato ketchup or house ground lamb with melted feta. From the quiche du jour to the salad of grilled shrimp with spinach and watermelon, all is local and exceedingly fresh. The roasted red pepper tartine with pulled free-range chicken and melted smoked gouda is a favorite. One of the island's poshest restaurants, it inhabits a charming Caribbean house-like structure with twinkly hilltop views of Charlotte Amalie harbor below. Its pasture fed Angus beef wins high praise, but the kitchen also has a flair with seafood. The Banana Tree filet combines both: shrimp and filet mignon with asparagus and béarnaise sauce. Artistic touches embellish fresh product such as the tangerine seared salmon and zinfandel braised pork shank with horseradish risotto. Side dishes such as parmesan dusted zucchini misto and goat cheese glazed mashed potatoes threaten to upstage the entrees. Definitely order a basket of the house bread, a crispy homemade ciabatta loaf baked with garlic and served with creamy gorgonzola dip. A little bit Asian and a lot Latin, this fusion hot spot lives above the beach at the Marriott Frenchman's Reef resort. 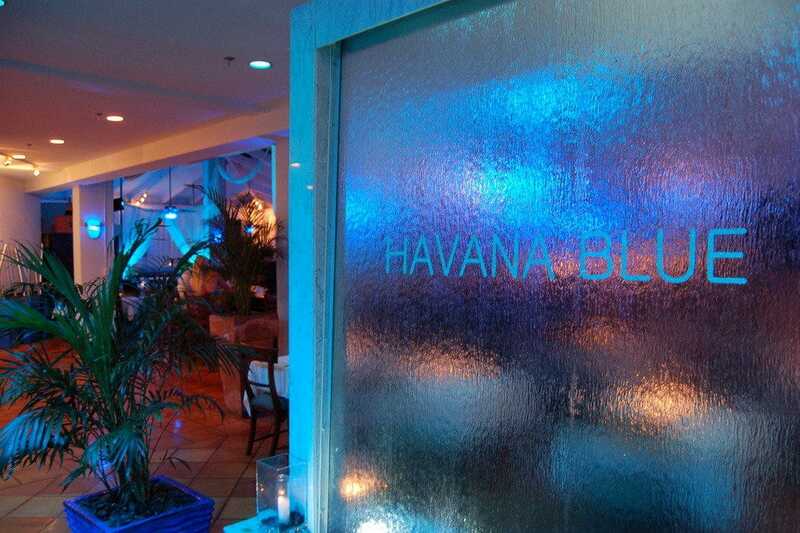 A vision in blue light, its décor is as hip as the tapas and ambitious dishes it serves. It tweaks the same old standards with sparkle and innovation on its ever changing menu – fresh coconut, wasabi guacamole and yucca chips with the ceviche, for instance. Tempura calamari comes with a tamarind and lime zest emulsion. A miso lemongrass sauce glazes the sea bass. The Tuna Trinity features chili blackened ahi with citrus jicama slaw, Thai lime "rain" and cilantro effervescence. Cocktails such as the Dirty Chica and $225 Sapphire Blingtini mingle well with the menu's spicy entrees. If this all sounds expensive, it is; but well worth the splurge. Menu descriptions read like poetry at this award-winning restaurant overlooking Mahogany Run golf course on St. Thomas' north shore: pickled peach and fresh burrata salad, truffle honey stung chicken with lavender waffles and guavaberry syrup, Berkshire pork jowl with apple butter and grilled yams and grilled bluefin tuna with tomato bacon jam. One of St. Thomas' finest dining experiences, it inhabits a historic sugar plantation stable with two-foot thick stone walls and warm, soft lights. 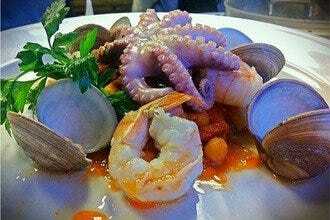 It caters to steak, seafood and vegetable lovers with artistically conceived menus that re-envision local ingredients. Guests can select their own fish or steak in the kitchen. The desserts are divine, and the wine list is equally impressive.